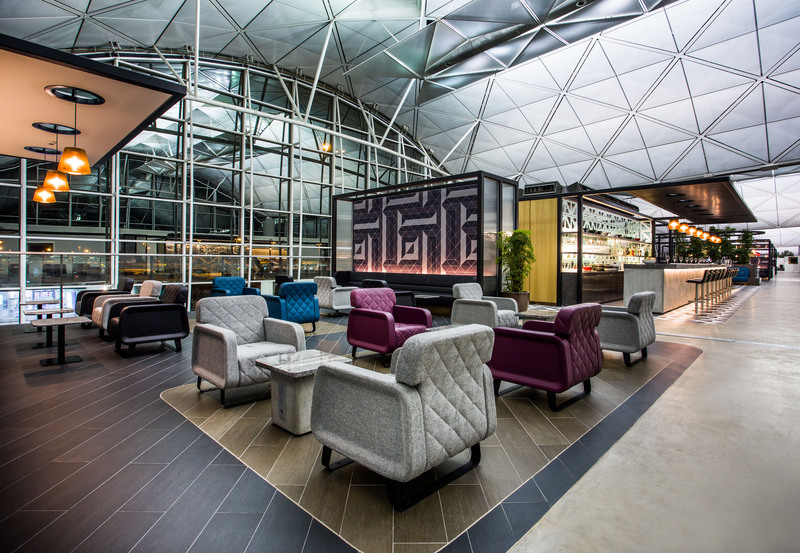 When Qantas released images of their new lounge in Hong Kong back in April, we wanted to dig a little deeper into the design ethos of the new lounge, brought to us by Sumu Design, an architecture and interior design company based in Australia. We talk exclusively to Felice Carlino, the director of the agency and lead on the project. 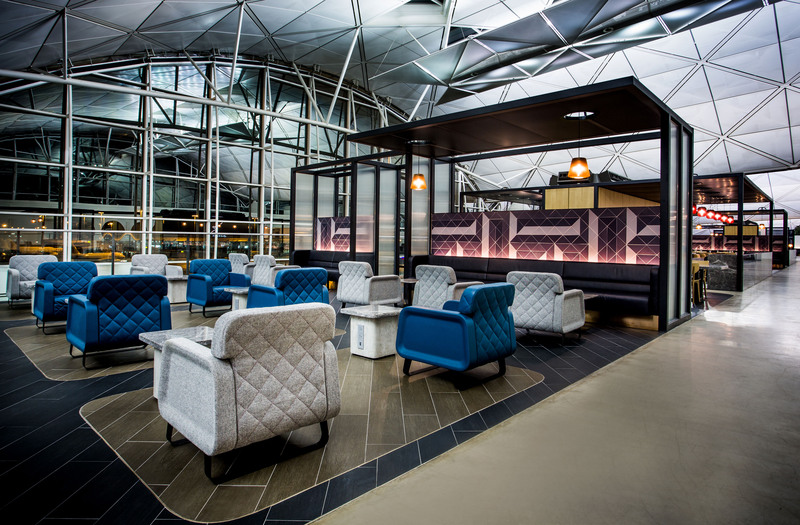 Some of you may already have had the opportunity to visit the lounge, situated conveniently across from gate 15, (the Qantas gate) we sure know our Antipodean friends at Australian Business Traveller have already tried and tested the space. Thanks for chatting with TheDesignAir. You have now designed Qantas Lounges for Hong Kong, and Singapore, are there any more on the cards? 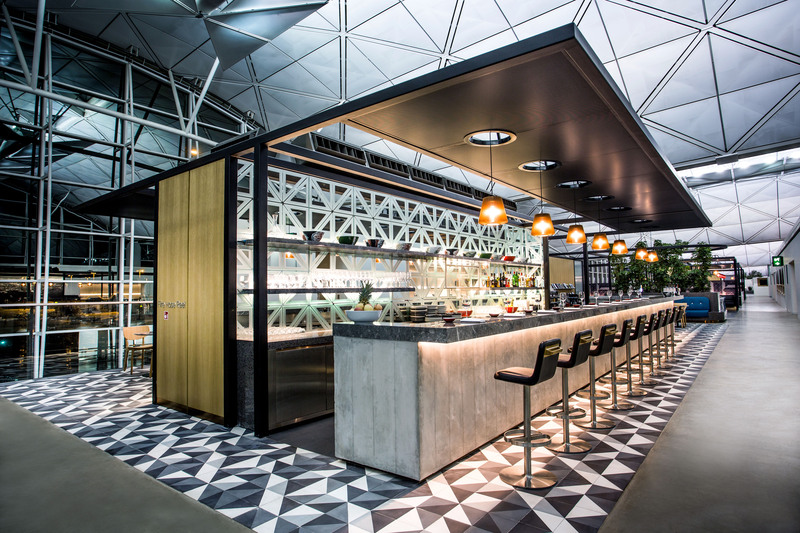 SUMU Design in collaboration with CAON studio recently completed the Qantas Hong Kong Lounge and the Qantas Singapore Lounge. While we’re not working on any new lounges at this time, we are looking forward to the next opportunity. What is the design signature that runs throughout all of the Qantas lounges? 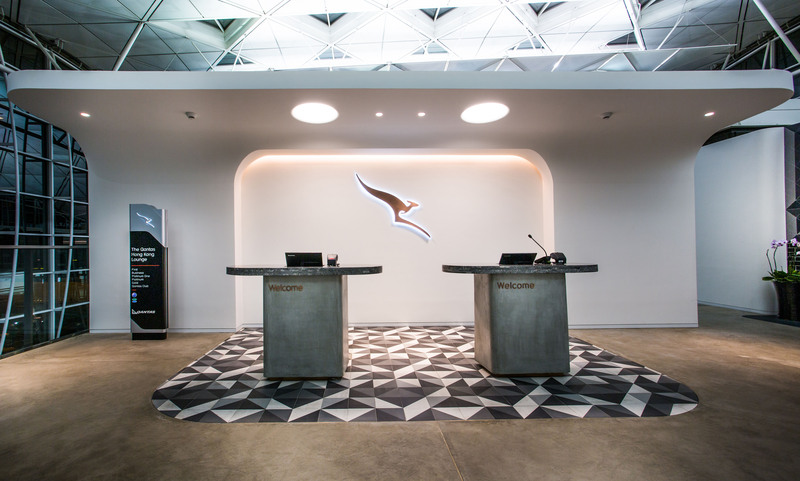 Qantas’ brief was to reflect a new boutique style concept representing Hong Kong through its design, and taking cues from the design previously developed for the Qantas Singapore Lounge. As such, Singapore and Hong Kong are based on a similar approach, that is, a boutique style and a design that reflected elements of the local port and region. The lounges are similar in area but differ mainly in their layout and aspect. Hong Kong is a narrow lounge stretching 120m in length. 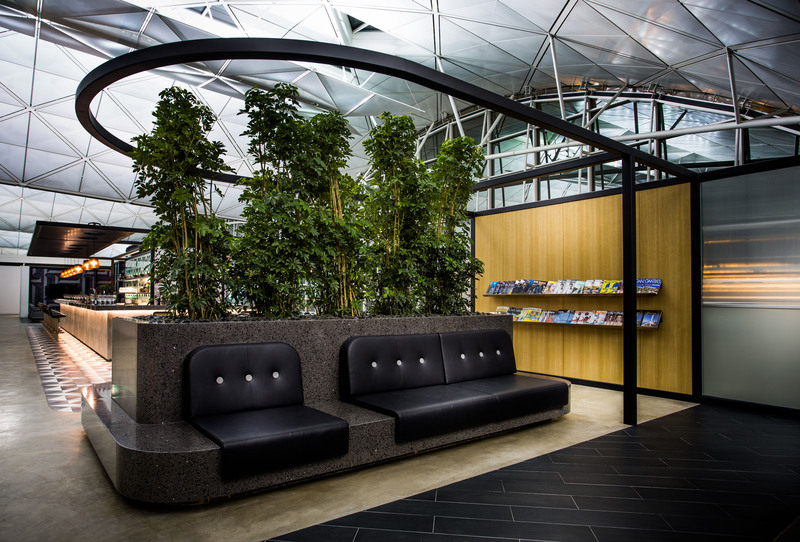 It is located within the open cabin of Hong Kong Airport with views of the apron and surrounding terminals. It is bathed in natural light, creating an open outdoor feel. Singapore by comparison has an enclosed and consolidated layout, its feel is more intimate overall. The lounges do share subtle core elements such as the entries to the lounges, the bars, communal dining, menus designed by renowned Consulting Chef Neil Perry and a Sofitel service experience. And what is so special about the Hong Kong Qantas Lounge in particular? Hong Kong is the perpetual Asian city: a fluid, swiftly evolving metropolis surrounded by stunning wilderness. It is a vibrant, vertical city split by an expanse of water and surrounded by calm and nature. This was the concept and vision that influenced both the planning and architecture of the lounge, in which the Qantas Hong Kong lounge became a metaphor of Hong Kong. 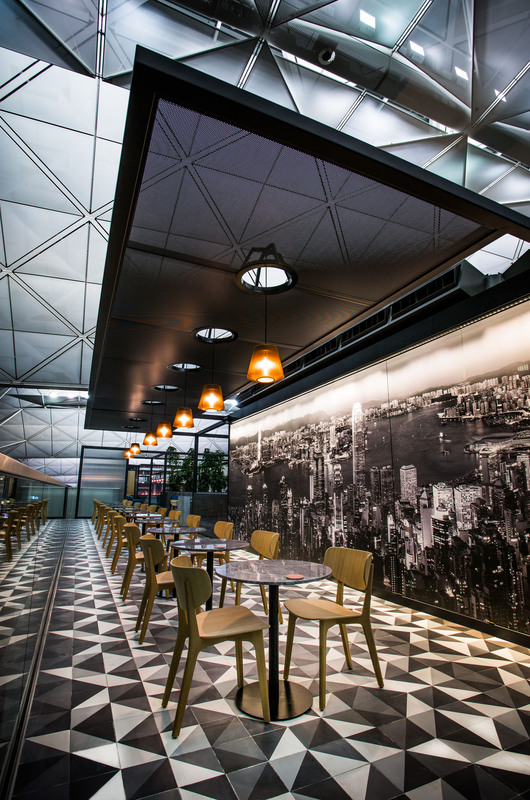 Hong Kong Island and Kowloon Peninsula are represented by the bar and dining areas which capture the vibrancy, movement and interaction of people. These elements are surrounded by the calm and relaxed atmosphere of the lounge areas. The lounge areas in turn represent the natural landscape and beaches that surround the built-up zones of the city. The verticality of Hong Kong is embodied within the building’s large steel structures. The structures are used to break up the 120m-long, 2,000sqm site, creating intimate, private and secluded spaces for customers. These structures reference the steel signage structures fixed to the sides of buildings within the city area. Meanwhile the canopies pay homage to the city’s side streets where small eating houses and stalls provide privacy and escape from the bustling city while still remaining connected to the action. Hong Kong is such a buzzing eclectic city, it must have provided a myriad of challenges and rewards. What was the most enjoyable element designing for the Hong Kong Lounge? We really enjoyed designing a space for multiple user needs. Customers have different needs and like to interact in different ways. Coming to understand how different people might use the lounge in different ways was an enlightening process. And creating that balanced mix of intimate and private spaces, and areas of interaction and excitement, was one of the most enjoyable elements of designing the Hong Kong Lounge. 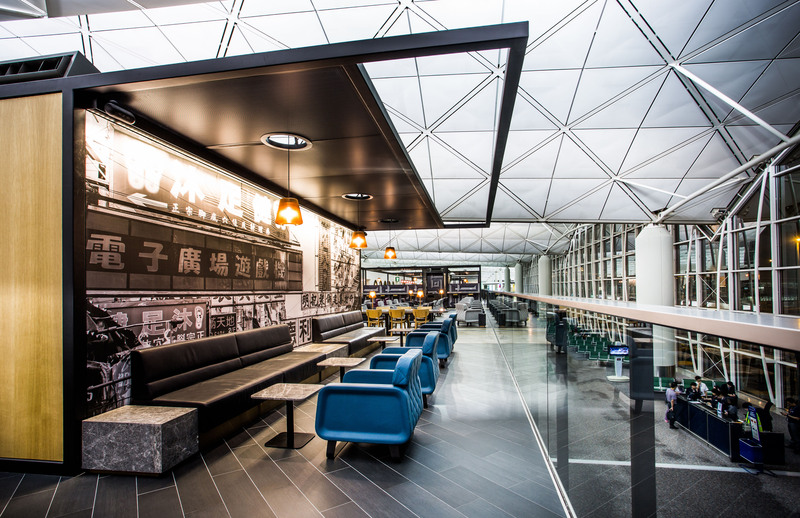 To give you a sense of the lounge: The Qantas Hong Kong lounge has a capacity for 300 people and includes a full commercial kitchen, buffet, bar, showers and toilet facilities a family zone and flexible working area. 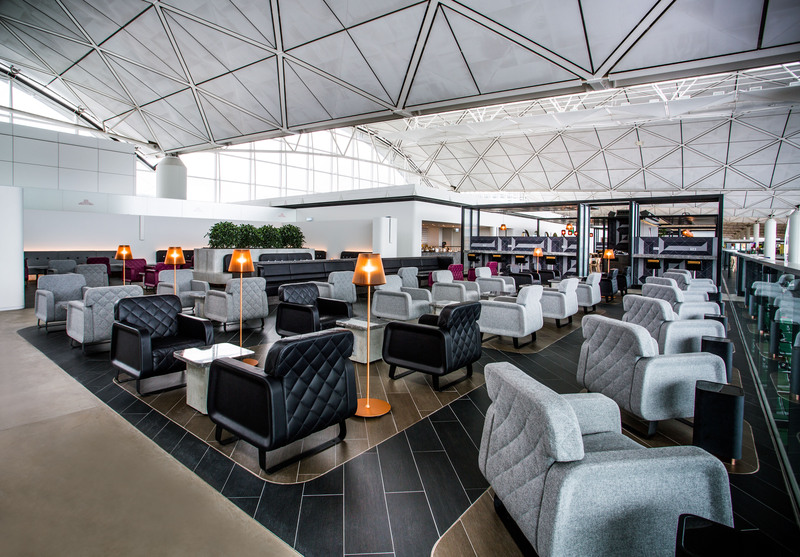 The lounge is located within the open cabin of Hong Kong Airport with panoramic views of the apron and surrounding terminal. During the day it is bathed in natural light. The location of the lounge allows travellers to experience the outside environment. As a result the open cabin makes you feel as though you’re outdoors and not locked away in a dark room. The lounge is also feels like an extension of your holiday: it’s a calming space to wind down after a long and intense business trip. It’s a space in which you can prepare yourself for your next meeting or onward flight. Creating varied spaces where people can interact in many different ways became our main goal. Some people like to be on their own. Some people like to mix with other passengers – strangers who come together to enjoy a chat. There’s also the possibility that people might bump into friends or acquaintances who happen to be in the same place at the same time. Some people want to do work while having a meal. Other passengers combine it all. We spent a lot of time in the lounge, post opening, just watching how people used the space, where they sat, what they do, how they use the facilities. It’s interesting to see how well the whole space is used. It’s most enjoyable to see people use the lounge in multiple ways and not just as a glorified waiting room. It was our intention to create a space that was multi-dimensional in use and atmosphere and its really gratifying to see people using it in that way. So what was the most limiting element? The fire regulations within Hong Kong airport meant we were confined to using materials with low combustible properties. But we took this limitation and turned it to our advantage, in order to meet the brief: “Representing Hong Kong through its design”. The finishes we used within the lounge represent traditional, colonial and modern Hong Kong. The rawness of the streets and old architecture is represented by the raw concrete finishes on the floor, bar and tables. This is juxtaposed against the use of premium finishes such as leather, silver grey stone, timber veneer, timber textured floor tiles throughout the lounge – representing the new modern day Hong Kong. As mentioned earlier, our use of hard materials such as concrete, stone, tiles and steel had a dual purpose of adhering to fire regulations within the airport. Every material/finish, piece of furniture, equipment and accessory was required to have fire load calculations done on the material make-up of each item and the combination of each item, either individually or as a group setting. The fire loading not only influenced the finishes used within the design it also impacted on the layout and planning of the lounge. What do you think other lounges could benefit from around the world? We believe a really successful and well-designed lounge is one that caters for individuals’ unique and different needs. There will be a good food selection, and a combination of areas for relaxing and/or engaging. A good lounge is not only about good design and facilities, it’s also about good customer service. We strongly believe one of the things that sets the Qantas Hong Kong and Singapore Lounges apart from their counterparts is the service provided by the Sofitel team. Qantas’ commitment to providing premium customer service (by having a specialized team who are highly skilled in looking after the needs of their customers), enhances the spatial experience we have designed. The two work hand in hand: a good functional design with a highly skilled service. At SUMU Design we pride ourselves in facilitating that synergy.